The real estate industry in New York is famous (or infamous) for its outsized personalities, who make headlines not only for their property deals, but also for their head-to-head battles, art collections and White House aspirations. For every boldface frontman, however, there’s a behind-the-scenes wizard who is running day-to-day operations or shaping the direction of the company. These top lieutenants often decide what buildings will look like, how they’ll be marketed and who will sell them. The consummate inside operators, they’re well-known power players to a small circle of insiders in their own real estate universe, but the rest of the industry rarely hears about them. For instance, Larry Silverstein is, of course, the face associated with high-profile construction at Ground Zero. But behind-the-scenes, it’s Janno Lieber, the company president and Silverstein’s right-hand man, who is responsible for ensuring that the buildings actually get leased up and construction stays on schedule. Similarly, the city’s tallest-ever condo-hotel One57, from Extell Development Company, is an obvious feather in the cap for Gary Barnett, the company’s president. But he might not have had as much success assembling its centrally located Midtown parcel without the expertise of acquisitions chief Dov Hertz. Below, The Real Deal pulls back the curtain on these and other wingmen. At Forest City Ratner, decisions about where to locate a building — on Spruce Street in the case of New York by Gehry, or at Atlantic Yards in Brooklyn for the under-construction Barclays Center — are made by Bruce Ratner, chairman, and MaryAnne Gilmartin, vice president. But figuring out what the building will cost, how much time it will take to build and what it will look like are the responsibilities of Bob Sanna. While Ratner and Gilmartin are the faces of the company, Sanna, an architect by training, is the construction manager and point person for all the company’s high-profile projects. Since 1988, he’s completed 40 projects for the firm, including the New York Times headquarters on Eighth Avenue; Metrotech, the 11-building Downtown Brooklyn office complex; and Regal’s United Artists cinema at 100 Court Street. Few other development firms give the in-house construction manager as much sway in decision-making as Sanna, who oversees an 18-member team. Sanna said his regrets, so far, are few, like wishing that the Atlantic Center mall in Brooklyn, for instance, had more windows. But when it was constructed in the late 1990s, Forest City capitulated to the demands of their big-box retail tenants, who were convinced that only replicas of their suburban stores would work. Still, the two adjoining complexes, which have more than 400,000 square feet, in many ways opened the doors for the company’s nearby Atlantic Yards project. And the retail complexes have their fans. “They stretched out the whole retail market all the way to Downtown,” he said. In New York, assembling the parcels of land needed for a large high-rise requires navigating a minefield of complicated issues, like rent-regulation, air rights and zoning codes. Extell is known as one of the companies that’s mastered this art of assemblage, thanks in large part to Hertz, who handles land and building acquisitions for the hard-charging firm. His latest coup is stitching together the seven parcels, plus two buildings’ worth of air rights, needed for One57, a 90-story condo-hotel at 157 West 57th Street that will be the country’s tallest residence when it’s completed in 2013. Barnett has already sold 30 percent of the under-construction building and has a penthouse on the market for $115 million (see “One57 buyers seek luxe, if temporary, rental homes”). But Extell began collecting air rights for the building 13 or 14 years ago. Hertz, who joined the firm in 2003, spearheaded the purchase of air rights over two five-story apartment buildings on West 58th Street, which allowed for an increased building height, he said. Knakal confirmed what other sources said — that without Hertz, getting One57 out of the ground would have been difficult, if not impossible. Similar accomplishments include the new Gem Tower, a 34-story commercial tower in the Diamond District (see “The bling building: A review of the Gem Tower”), as well as Ariel East and West, both Upper West Side condos. There was also 535 West End Avenue, which required five lots and called for relocating tenants, Hertz said. The Lucida on the Upper East Side needed four parcels. And a planned Hyatt at 135 West 45th Street needed seven lots and air rights. “I think I just get it done in the end,” Hertz said. 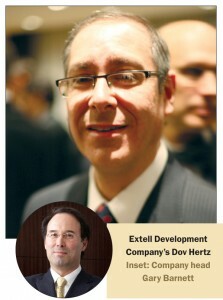 Hertz, whose first name rhymes with “cove,” isn’t a lifer at Extell, which Barnett founded in 1989. In the 1990s, he worked as a commercial broker for Eastern Consolidated for two years before joining Everest Broadband during the dot-com boom, when his Rolodex of landlords became useful in wiring office buildings with Internet service. In total he wired 200 million square feet nationally, he said. Afterward, it was back into real estate, courtesy of a one-year stint with the Lawrence Group, where his Rolodex continued to swell. In fact, that deep roster of contacts, sources said, is one of the reasons Extell came calling. While some new-kid-on-the-block brokerages are trying to reinvent the wheel with unprecedentedly large commission splits, the old guard is sticking to a more tried-and-true formula, boosting their brick-and-mortar presence in a bid to win clients. Halstead Property, which was founded in 1984, is one of those firms. The firm — which doubled the size of its headquarters last year, relocating to the 14th and 15th floors of 499 Park Avenue — is hanging its shingle on new offices in suburban and second-home markets in the Hudson Valley, New Jersey and Connecticut. Many of the expansion duties fall to Gricar, who last spring left his job as manager of the West Side office of Brown Harris Stevens (he also put in seven years with Corcoran) to fill a post created just for him. The new post makes Gricar the de facto No. 2 executive at the company, behind firm president Diane Ramirez. “The owners felt that with the growth of the firm, another layer of management was required,” he explained. Since coming on board, Gricar said he’s worked “hand in glove” with Ramirez. He has considerably boosted payrolls at 499 Park: In the last 10 months, the office’s size has swelled from 60 to 120 agents. And, he said, he’s planning to bring that number up to 150. “The name of the game is recruiting and retention,” he noted. 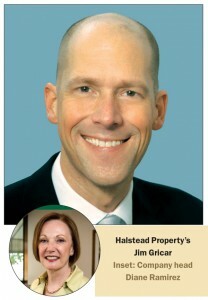 Even though BHS and Halstead share the same corporate parent in Terra Holdings, the move to hire Gricar was somewhat surprising, as the two brands are distinct, and lateral moves are rare. Heading up World Trade Center redevelopment for Silverstein Properties is the real estate equivalent of being the star pitcher for the Yankees. 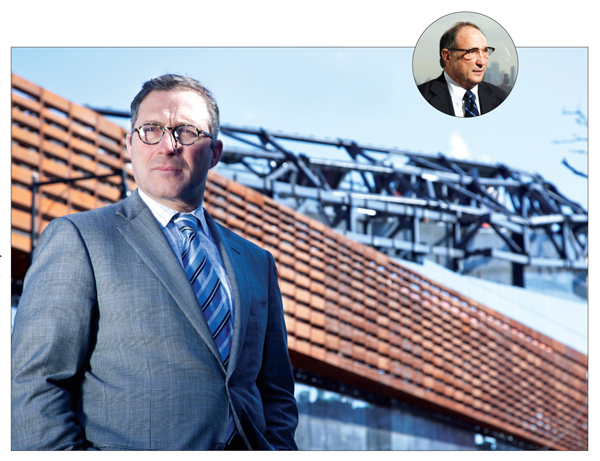 The job — the most important at the development firm — falls to Janno Lieber, who leads the firm’s so-called World Trade Center Properties division. Lieber, 50, who’s been with Silverstein since 2003, oversees construction, public relations and leasing of the three towers, Nos. Two, Three and Four, that Silverstein is attempting to build at Ground Zero — the most high-profile (and most complicated) construction project in the country. The process, which has seen major headway in the last year after long delays, has been fraught with controversy about what would be built on the site, and who would pay for it. On the plus side, Tower Four, which has added windows to about 60 percent of its 72-story frame, has inked deals with the city and the Port Authority and is now 50 percent leased. But with asking rents reportedly in the $80-a-foot range — about double the average for Lower Manhattan — filling the rest of the building with private-sector tenants may be challenging. And in order for some key financing to come through, Tower Three needs a big tenant to commit to a 400,000-square-foot chunk of space. Silverstein has publicly threatened to cap the structure at seven stories if it can’t get a tenant. Lieber pointed out that this possibility was part of the 2010 deal that got the project moving again so it wasn’t a big surprise. Plus, with so many leases now turning over in the city, “we are confident of hitting that mark by 2013,” he said. This angling for tenants comes as Brookfield, which owns the nearby World Financial Center, is on the hunt for major corporate tenants itself (see below), though Lieber said his buildings are an easier sell. Brookfield’s “buildings are great but they’re a little bit older,” he said. Other comparable projects, like Manhattan West, also from Brookfield, and Hudson Yards, from Related, will be completed long after the World Trade Center is, he added. Lieber’s resume includes a stint as assistant secretary for policy at the U.S. Department of Transportation during the Clinton Administration, when he worked on JFK’s AirTrain project with the Port Authority. Later, he was employed by Ruben Companies, a commercial and residential developer, where he helped put together the deal with Vornado that almost got a high-rise built atop the Port Authority Bus Terminal, before the Sept. 11 attacks scuttled it, he said. Together, those jobs gave Lieber the chops needed to navigate competing public and private interests, sources said. Lieber despises the characterization of himself as some sort of one-man band who makes many of the decisions without Larry Silverstein. Silverstein is a constant presence, he explained. “His relentless optimism and determination has fueled our work,” Lieber said. But Lieber may be demurring. 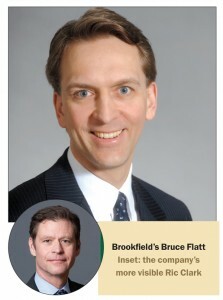 He’s worked for the Canadian Brookfield Asset Management for more than two decades, and has been a front-and-center dealmaker in New York for that entire period, but Bruce Flatt flies so far under the radar as to be almost invisible. 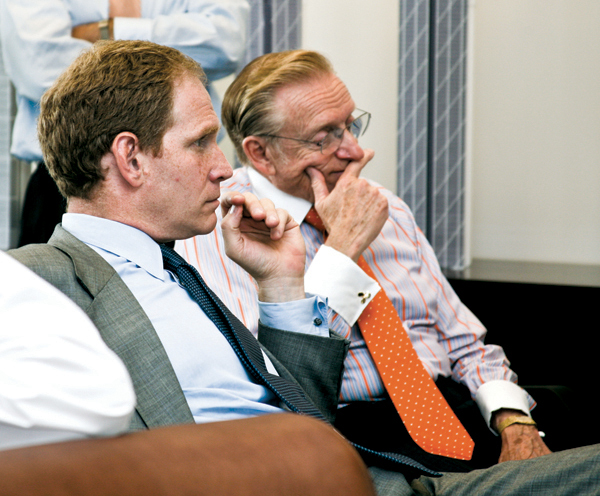 Much of the industry views Ric Clark, the CEO of Brookfield Office Properties, as the face of the company. But since BOP is actually a spin-off of Brookfield Asset Management, where Flatt is the CEO, Flatt is technically Clark’s boss. In a profile of Brookfield in The Real Deal last month, one insider close to the firm called Flatt the “wizard” behind the scenes. In addition, sources said he’s been hands-on in New York City for years; he was instrumental in beginning negotiations to buy the World Financial Center out of bankruptcy in 1993, and led an effort to purchase Lehman Brothers’ interest in one of Brookfield’s WFC towers for just $128 per square foot in 2002, months after the Sept. 11 attacks. “Bruce Flatt — that is the guy you make a big deal with,” one leading leasing broker said. But a new aggressiveness by both Brookfield divisions could substantially elevate this low-key executive’s public profile. First, Flatt embarked on a $200 million retail makeover of the World Financial Center, the company’s signature address, to add new restaurants and shops. Upstairs at the site, Flatt is marketing millions of square feet of office space in a direct challenge to the World Trade Center, which is under construction across the street. Simultaneously, Brookfield Office Properties is breaking ground on Manhattan West, an ambitious two-block project at Ninth Avenue and West 31st Street, with four towers containing homes and offices. Flatt cultivates a low-key mien in part because the firm is international with holdings outside of New York, which keeps it out of the media glare, analysts say. With Roth, the chairman, and CEO Michael Fascitelli staying above the fray, Greenbaum, the president of Vornado’s New York division, is often the one getting his hands dirty with nitty-gritty details, sources say. A case in point: his appearances in 2010 before the City Council to urge the approval of 15 Penn Plaza, a controversially tall, 1,216-foot tower that would visually compete with the nearby 1,250-foot Empire State Building. In fact, the Malkin family, which owns the Empire State Building, launched an aggressive offense against the tower, which it argued would blight the iconic skyline. To sweeten the deal, Greenbaum dangled $150 million in subway improvements. Those improvements would connect the Garden’s subway trains — namely, the 1, 2, 3, A, C and E lines — to Herald Square, a block east, by reopening a defunct tunnel under the current Hotel Pennsylvania, which sits on the land where 15 Penn is to be built. This type of grind-it-out project is Greenberg’s specialty, sources said. 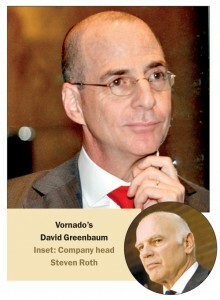 And they have helped turned Vornado into one of the country’s top-rated real estate investment trusts, which means Greenbaum enjoys a privileged orbit in New York’s real estate universe. The development arm of the company that owns the Gristedes supermarket chain, Red Apple is the province of colorful billionaire John Catsimatidis, who flirted with running for mayor in 2009 and may do so again in the next election. Zorn, who is relatively press-shy and almost impossible to track down, seems to be Catsimatidis’s polar opposite, which suits him fine. 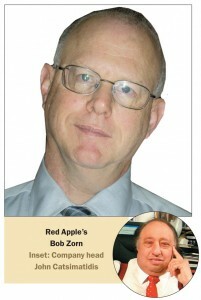 Zorn’s duties at Red Apple, which is more aggressively branching into ground-up residential and retail development in the city, are substantial. For one, he oversaw the construction of the Andrea, a 95-unit rental with a pharmacy and supermarket at 218 Myrtle Avenue in Brooklyn. The project is now fully occupied, and Zorn plans to break ground this summer on 160 Myrtle, another rental. Two other residential towers are slated for a two-block site there. In addition, there are plans afoot for projects with the medical school at Columbia University, Catsimatidis said. Sometimes an executive’s position on a company’s totem pole can be misleading. 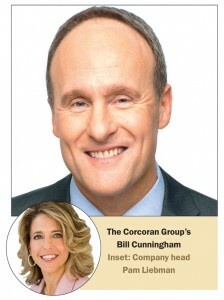 Cunningham, for instance, is not officially a member of Corcoran’s executive team, according to the firm’s website. But those employed there said his reach is formidable as the powerful top manager at 660 Madison Avenue, where 394 agents, plus a few dozen support staff, toil across three floors in Corcoran’s largest office — the nerve center of the über firm. Specifically, Cunningham, who works closely with Corcoran CEO Pam Liebman, must come to the defense of brokers when, say, clients try to force them to reduce their standard commission rates. He also has to step in on behalf of besieged brokers if sellers try to impose ultimatums about giving their listings away to other firms if the Corcoran agents can’t sell them fast enough. “You need time to get your advertising in line,” Cunningham said he explains to clients. More commonly, though, he must play peacemaker, brokers say, settling any broker-on-broker disputes with agents from other firms. Disputes often arise, for example, when a broker leaks a client’s name even though a non-disclosure agreement prohibits it. “People mean well, but a lot of times there is a misunderstanding,” said Cunningham, who worked as a broker and real estate investor in Florida and Texas before becoming an assistant in Corcoran’s West Side office in 2001. He worked his way up from there. One Corcoran broker said he does a good job of stepping up to bat for his colleagues. “If you come to him with an issue, he definitely finds a solution. He’s very good,” the source said. Hired in 2008 (soon after leaving the imploding Lehman Brothers, where he worked in the real estate group), Alvarado has wasted little time asserting himself at his new Connecticut-based firm, which is headed by Barry Sternlicht and focuses largely on hospitality projects. Alvarado is not the No. 2 at the firm — that’s Jeffrey Dishner, who oversees real estate acquisitions globally for 10 offices in six countries. In fact, Alvardo is not listed as part of the firm’s executive committee. But at 32, he is regularly a presence at the table where deals are being cut, especially for New York properties, according to those who have worked with him. Indeed, Alvarado, who graduated from Dartmouth in 2003, is the point person on many New York deals, sources say. He’s played a major role in at least nine local deals that have recently closed or are in the works. And he has a good chunk of change to play with: The company has $2.8 billion in its latest two funds, with another being raised now. Though Alvarado declined to comment, his recent New York City deals include the $72 million purchase of 1414 Sixth Avenue from Murray Hill Properties, as well as the $67 million acquisition from the New York Public Library of 20 West 53rd Street, where Starwood and Tribeca Associates are planning on building a 120-room Starwood condo-hotel. Partnered with Joseph Moinian, Alvarado is also busy with 237 West 54th Street, a Midtown West development. 158 West 29th Street, New York, NY 10001.